Echoes of Rossport as Pallaskenry 5 face Jail. - 2 local farmers ( Donal O’Brien and Patrick Culhane), one of whom is now critically ill in the Regional Hospital Dooradoyle. - County Councillor Noreen Ryan. - Tommy Clark, old age pensioner. Our neighbours are going to jail today to retain our natural spring water supply. Outside PALLASKENRY CHURCH at 9PM this eve. "Water is not a commercial product like any other but,rather, a heritage which must be protected, defended and treated as such" EU Directive 2000/60/EC Page 1(1). THIS IS YOUR TOWN, YOUR WATER-SUPPLY AND YOUR FRIENDS. The above face the high court and jail on Monday, 12th of June@ 11am following a barrage of intimidation and bullying tactics from Limerick County Coucil.The five are representatives of a community campaign to prevent the replacement of a natural spring water supply with a group water scheme sourced from one of the most polluted rivers in Ireland. Local Councillors in the catchment area who have stood on the fence until now are now being called upon to ‘Stand up and Fight’ for the Pallaskenry 5. WHY ARE HERE AND FACING JAIL? Bleach Lough Campaigners are local protesters from Kildimo and Pallaskenry who are seeking to prevent Limerick County Council (LCC) from withdrawing our local spring water supply and placing the communities on a larger group scheme. WHY ARE WE PROTESTING AGAINST THIS SCHEME? - Our local supply is from a natural spring source with proven benefits. - The group scheme is not value for money - the laying of pipes, contractors and maintenance far exceeds the upgrading of our Pump House. This is another example of the democratic deficit alive and well in Ireland….Failure to consult and engage the constituency. We now call upon Edmond Gleeson our County Manager and Paul Crow the Director of Transportation and Water Services to explain their stance here today. We would like to thank all our supporters and families and friends and vow to fight this until justice has been seen to be done ... please register your protest with Limerick County Council by contacting LCC Headquarters and local councillors throughout Limerick. Take the Dock Road / N69 / Tralee Road out of Limerick. You'll come to Kildimo. Drive out of Kildimo and take the second turn right which is signed Pallaskenry. Stand firm a chairde,the government will not get away with this behaviour-just like they havent done and will not do in North Mayo. this wasn't covered on the news. did they get jailed? 3 have had their charges dropped because they were unaware of the injunction and have given assurances that they will not breach the court order again, One woman's (Orla Kaiser) case is going forward as part of a judicial review to be heard on thursday and one person's case was not heard as he is seriously ill in hospital. RTE news didn't mention anything about this case. on any of their 'news' programs (or whatever is left of them after their further transformation into a summer light entertainment station) Joe Duffy decided to concentrate on the plight of Concert Goers stuck in traffic after the Eagles Concert. 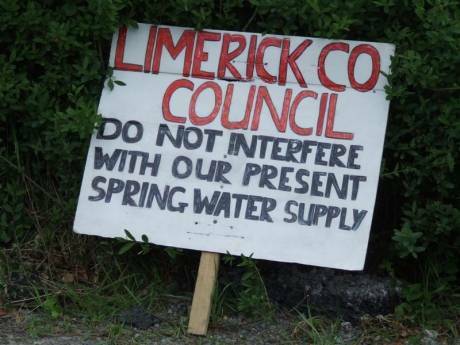 Limerick County Council are in breach of the EU Water Framework Directive which came into force in 2002. Two of its stated aims are : "To maintain the 'high status' of water where it exists." and : "To prevent any deterioration in the existing status of water"
Note the word 'status' - this means more than just quality - it means the status of the water as both a habitat for wildlife and as a drinking water supply for humans. - can we bring an injunction against them ? ! - We can certainly make them answer to the EU Commission. Well done Orla and supporters !